The Redeemed Christian Church of God (RCCG) through its provincial headquarters on Lagos Island has cancelled a three-day outdoor crusade of one its parishes, after the criticism that followed the invitation of the Fuji musician Wasiu Alabi Pasuma as a guest artist for the crusade. Pasuma’s picture appeared on the handbill advert alongside gospel singer Tope Alabi and a former band leader of the late Fela Anikulapo’s Egypt 80 band, Kereke Jike. Naij.com gathered that the decision to stop the programme was because the church headquarters felt the idea to bring Pasuma and his fans to the church was not well conceived. A source who spoke on condition of anonymity said the organisers did not do a detailed consultation before going ahead with the programme and as a result the programme has been cancelled and the pastor in charge of the church along with the organising committee have been suspended as they now await sanction for dragging the name of the church in the mud. 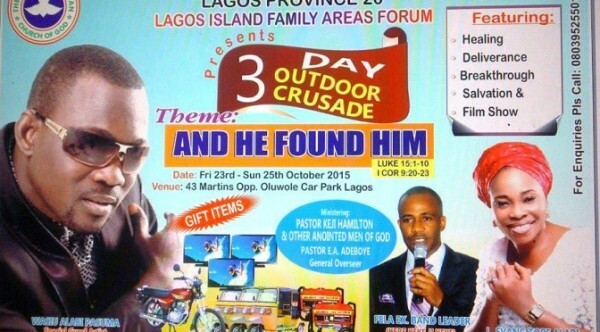 The crusade organised by Province 20 and tagged ‘Lagos Island Family areas forum’ was expected to feature Pastor Keji Hamilton and billed for Friday, October 23 to Sunday, October 25.